Published By – EMI Music Publishers Ltd.
First press, gold thick paper inner sleeve. Two different coloured inner sleeves - gold for the first pressings and purple for the later ones. Please could someone shed some light on this record for me? Bought the NGD BOXSET. Buy it!! Have the vinyl too. Remember it first on chrome cassette! Immense. Interesting to see and hear how this album is being reappraised, particularly with a 6 CD set (yes 6). 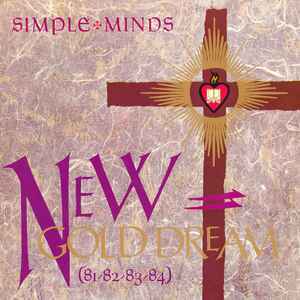 I have with friends played the game of trying to match the fall from artistic credibility and creativity that Simple Minds went through post New Gold Dream and still we struggle to find a band who placed such a shadow over their superb early work. New Gold Dream was at the time and still is a groundbreaking, soundscaped, fusion of guitars, electronics, soaring deeply felt vocals and art rock sensibilities. Just drop the needle, sit back, and enjoy. By far and away the best full length release by Simple Minds. Track to track non stop great listening. Promised you a miracle maybe the only lackluster track. Like the other comment says, great b-side stuff throughout this. Hunter and the Hunted I have been known to play for hours and hours. Herbie Hancock on the backing keyboard blows up the emotional solo here while jim kerr seductively sings it to fade. Not a bad tune on here.